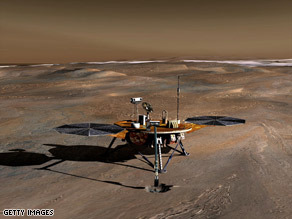 (CNN) — The Phoenix Mars Lander has entered a state of suspended operation called “safe mode” due to low power, mission managers said Thursday. And while they hope to recharge batteries and reactivate the spacecraft in the coming days, they say the rapid onset of the Martian winter means Phoenix’s days are severely numbered. NASA officials say the rapid onset of the Martian winter means the Phoenix Lander’s days are numbered. “This is a precarious time for Phoenix,” Phoenix project manager Barry Goldstein of NASA’s Jet Propulsion Laboratory said in a written statement. The Phoenix team knew when they selected a landing site on Mars’ arctic plain that the spacecraft would not survive a winter there, but they picked it anyway because satellite observations indicated there were vast quantities of frozen water in that area, most likely in the form of permafrost. They thought such a location would be a promising place to look for organic chemicals that would signal a habitable environment. The spacecraft landed on May 25, and has conducted five months of research, scooping up soil samples for analysis in onboard scientific instruments. Phoenix landed at mid-summer inside the Martian arctic circle where the summer sun never sets, so the solar-powered craft had plenty of power for the first few months of its mission. But temperatures have been dropping in recent weeks, as the nights get longer and winter weather sets in. Daytime high temperatures have only been about -50 Fahrenheit, dipping down to -141 at night. In the coming weeks, the sun will set for the season and the long night of a polar winter will begin. Mission engineers say that, with no sunlight reaching the solar panels, the spacecraft will die. Eventually, snow and advancing polar ice will completely cover Phoenix. Mission managers say they may attempt to reactivate it after next spring’s thaw, but caution that it is extremely unlikely such efforts would be successful. Researchers have not found the organic chemicals they were seeking in the soil, though they did gather a lot of information about its chemistry. Science team members say they will be sifting through the data for months, if not years. NASA‘s next mission to the red planet is the Mars Science Laboratory, a large, nuclear-powered rover designed to traverse long distances carrying a suite of onboard scientific instruments. It is scheduled to launch next summer, though ongoing technical problems may require a postponement to 2011. This entry was posted in Robotics on October 31, 2008 by enddl22. 2008/10/03 – [Mobile gadget/iPhone & iPod Touch] – 아이폰 또는 아이팟터치로 블로그를 하자! – 워드프레스의 WPtouch 플러그인 소개와 터치로 접속한 스샷 포함 – 실행화면은 이곳에서 확인하면 된다. wordpress.com에서는 ﻿워드프레스의 플러그인을 지원하지 않는다. 그러므로 웹 호스팅 서비스 업체를 이용해 설치형 워드프레스(http://ko.wordpress.org/)를 웹 호스팅 업체에 설치해야 한다. 설치에 관한 것은 아래의 주소들을 참고한다. 워드프레스의 플러그인 설치 방법에서 설명한 것과 동일하다. gravatar.com(자신의 사진 아이콘을 저장해주는 홈피)을 이용한 자신의 아이콘을 답글을 자신의 아이콘을 보여줄 수 있다. 체크를 하면 답글에 아이콘이 보여진다. 워드프레스는 블로그의 글이 아닌 일반 웹페이지도 지원하는데, 그곳에 답글을 달 수 있도록 한다. Header Style 중 Header Title에 제목을 넣어줄 수 있다. 제목이 길면 아이폰으로 볼때 Search와 Menu 버튼이 깨어져 보인다. 블로그 글 목록에서 보여줄 항목을 선택할 수 있다. 아이폰에서 Menu 버튼을 누르면 나오는 메뉴 목록에 메뉴들을 추가하거나 바로 위에 있는 아이콘들과 메뉴를 연결 해준다. 체크를 해야 메뉴 목록에 나타난다. 단 이곳에 메뉴 항목들을(About, Archives, Links, Photos 등) 나타나게 하려면 워드프레스의 페이지를 만들어야 한다. 만들때는 제목을 Archives, Links, Photos와 같게 해야 한다. 그 이외에 자신이 만들고 싶은 페이지를 만들어도 된다. Archives는 과거의 글들을 월별로 보여준다. Photos는 FlickrRSS http://eightface.com/wordpress/flickrrss/ 플러그인을 이용해 플리커에 올려져 있는 자신의 사진들을 보여준다. 페이지를 추가하면 선택한 스킨 테마에 따라서 블로그의 가장 위에 메뉴로 나타난다. Links, Archives, Photos 페이지는 아이폰을 위해 만들었는데, 일반 접속자에게 보여줄 필요는 없다. 이럴때는 특정 페이지의 하위 페이지로 만들면 된다. 즉, 소개 페이지를 만들었다면 그 아래에 Links, Archives, Photos 등을 두면 된다. 워드프레스는 계층적인 페이지를 가질 수 있기 때문이다. 추가적으로 유튜브 비디오는 기본적으로 지원이 되기 때문에 상관 없으나 다른 비디오 파일들은 아이폰에서 읽을 수가 없다. blip.it http://www.bravenewcode.com/blipit/ 라는 플러그인을 설치하면 WPtouch에서 아이폰에 맞게 보여준다. 단, 프로로 가입해야 한다니 결재를 해야 하는듯 하다. 메뉴에 추가로 나타낼 메뉴들을 선택할 수 있다. 플러그인들에 대한 설명들과 작동 여부등이 나타나 있다. Links, Photos, Archives 페이지, FlickrRSS 플러그인 등이 작동되는지를 보여주나 정확하게 못 보여주는 경우도 있을 수 있으니 직접 아이폰으로 되는지 확인하는 게 가장 좋다. WP-Cache http://wordpress.org/extend/plugins/wp-cache/ 와 WP Super Cache http://wordpress.org/extend/plugins/wp-super-cache/ 를 사용할때는 WPtouch 홈피 http://wordpress.org/extend/plugins/wp-cache/ 에 설명을 참고한다. Header Title에 제목을 줄여서 입력한다. 도저히 줄일 수 없는 경우에는 어쩔수 없이 wptouch 플러그인 파일의 소스코드를 수정해야 한다. 이 경우 버전업을 하면 계속 수정해 줘야 하는 불편이 있다. 설치하기 전이라면 바로 메모장에서 불러서 themes/default 폴더의 header.php를 수정한다. 또는 워드프레스가 설치된 곳에서 /wp-content/plugins/wptouch/themes/default 폴더의 header.php를 수정한다. font: 21px 부분이 폰트의 크기를 나타낸다. 즉, 21에서 조금씩 숫자를 낮춰가면서 아이폰의 사파리로 접속해서 이상없이 보여지는 지 확인하면 된다. 모바일로 여는 세상-anytime,anywhere 영자 기준으로 35자 씩이나 되어서 16px를 하니 이상없이 표시되었다. 자신의 웹 호스팅 업체의 블로그 폴더/wp-content/plugins/wptouch/images/icon-pool에 60×60 크기의 .jpg 또는 .png 파일을 올리면 된다. 개발자 홈피에 추가 아이콘 팩이 있으니 필요하면 다운 받아서 설치하거나 크기에 맞춰서 만들어서 해당 폴더에 올리면 된다. This entry was posted in IPod-touch on October 31, 2008 by enddl22. 처음엔 그냥 그저그런 이미지 편집 서비스인줄 알았는데, 쓰다보니 정말 쓸만한 기능들이 많이 포함되어 있네요. flauntR은 기본적으로 다음과 같은 서비스를 제공합니다. 간단히 이름/이메일 등의 개인정보를 입력해서 회원가입을 하고 사진은 컴퓨터에서 불러오거나 Flickr/Picasa/facebook 또는 웹에서 직접 가져 올 수 있습니다. styleR을 이용해서 이렇게 유명한 매거진 표지에 자신의 사진을 넣거나 상황에 따른 수백가지의 포토프레임을 이용해서 사진을 멋지게 장식 할 수 있습니다. 기본적으로 이동, 회전, 크기조절, 백그라운드 칼라 설정이 가능하네요. 합성 결과가 마음에 안들면 상단의 Reset 버튼을 눌러 언제든지 초기화 할 수 있습니다. editR을 이용해서 대부분의 온라인 이미지 편집 서비스처럼 간단한 편집 기능을 수행 할 수 있습니다. 사이즈조정/회전/잘라내기, 색상/노출 보정, 레드아이 보정의 편집 기능과 Effects 메뉴에서 세피아/블러/엠보스/샤픈/모노크롬 등의 기본효과, 모자익 효과, 커브 조절, 적외선/비그넷 등의 효과, 스케치 효과 등 여러가지 작업이 가능합니다. 작업이 완료되면 상단의 Save를 눌러서 이미지를 앨범에 저장하고 Download를 눌러 이미지를 컴퓨터로 다운로드 할 수 있습니다. 또 추가 기능으로 flauntR UI를 통째로 아이프레임 형식으로 블로그에 넣기, 윗젯 형식으로 보여주는 기능들도 제공하네요. 자세한 내용은 여기에서..
다만 아직 서비스 초장기라 그런지 아니면 사용자가 몰려서 그런지 몰라도 중간 중간 끊기거나 저장이 잘 안되는 문제가 발생하네요. 버그만 조금 다듬어진다면 Adobe Photoshop Express의 등장 이후 더욱 뜨거워진 온라인 이미지편집 시장에서 확고히 자리 잡을수 있을것 같습니다. This entry was posted in Photo on October 31, 2008 by enddl22.